Leading the way will be BSB and WSB racer Chris 'Stalker' Walker, four time BSB runner up and World Superbike race winner, will also be appearing. Walker, who currently rides for Tommy Hill's 'Be Wiser' Kawasaki team, will be riding the stunning new Kawasaki H2R, one of the most revered bikes in motorcycling. Scotland's Niall MacKenzie, triple BSB champion in the mid-'90s also enjoyed a successful 250 and 500cc career at World Championship level, which included 6 podium finishes and a highest championship place of fourth in 1990 riding for the Lucky Strike Suzuki outfit. Fellow Scot Ian Simpson, who enjoyed success on both the roads and circuits, is another famous RST rider who will be appearing in the parade. Simpson came to prominence in the Supercup 600 championship in 1991 but he will forever be associated with his 1994 Superbike campaign on the Duckhams Crighton Norton. He also enjoyed three TT wins with victory in the 1997 Junior and a Senior and F1 double the following year. James Whitham, instantly recognisable as the face of ITV4 TT coverage, will be swapping his microphone for a bike and taking to the TT course again. Whitham made his Mountain Course debut in the 1985 Manx Grand Prix. His career highlights included finishing runner up in his only BSB season in 1996, winning ten races and a five-year WSB campaign that included six podiums. James's fellow TV commentator Steve Plater will also be joining the line up. Plater, the 2009 British Supersport champion, is probably best known for his TT exploits. After becoming the fastest ever newcomer in 2007, a record that stood for 6 years until Josh Brookes broke it in 2013, Plater won the 2008 Supersport race and crowned his successful career with victory and a race record in the 2009 Blue Riband Senior TT. Ian Hutchinson followed Steve Plater onto the top step of the Senior TT the following year. Hutchinson's victory crowned the perfect week as it came after victory in all four preceding races. The Bingley Bullet will be appearing in the parade lap alongside the man who previously held the record for most wins in a week - four - Phillip McCallen, whose 11 outright TT wins place him 5th on the overall winners list. Hutchinson's appearance will be particularly noteworthy, as he will be riding Paul Bird's MotoGP Aprilia. Other TT race winners include Cameron Donald, who will be appearing on the Norton Domi Racer. Donald has three TT wins to his name including his double in 2008. 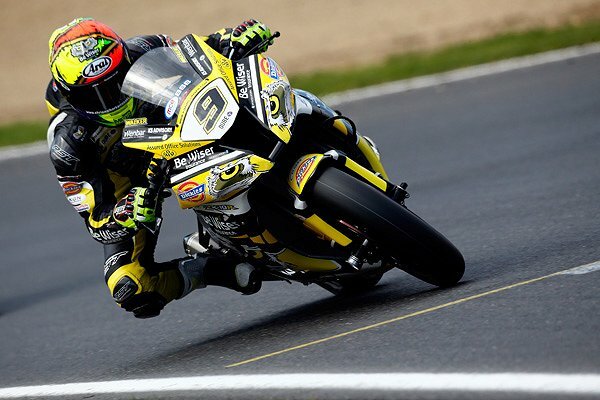 The Australian will be riding for Norton in this year's RST Superbike and PokerStars Senior and will also be representing Valvoline Racing by Padgetts Motorcycles in the two Monster Energy Supersport Races. Gary Johnson, who has secured strong rides at this year's races with Mar Train Yamaha in the Supersport class and GB Moto Kawasaki for the Superbike, RL360 Superstock and PokerStars Senior TT, will be hoping to add to his two TT titles this year while Lee Johnston, who secured his maiden Mountain Course win with victory in the 2014 Motorsport Merchandise 350 aboard an MV Agusta, is another RST ambassador who will be appearing in the parade lap. Other current TT riders due to participate include reigning TT privateer champion Ivan Lintin, Kent based racer Steve Mercer and MCN's Adam Child, who has competed in the Lightweight and Supersport classes. Jonny Towers, MD of RST distributors Moto Direct will also be joining the parade. Towers is no stranger to the TT Mountain Course having competed in the 1987 production TT Race.